Stuttgart has these wonderful little hidden little charms that make it a really great place to live. One of our favorites are the Besenwirtschaften, which are traditional Swabian wine houses. They’re operated by the families that own the numerous vineyards around the Stuttgart area, and by law they are allowed to open 4 months out of the year. They are scattered throughout the city and its surrounding towns, and if you find one you can enjoy very simple (and cheap) Swabian food and fresh wine from that year. One of my favorites is a place in Degerloch that a German woman introduced me to. It is essentially a living room that overflows into a side room, so the atmosphere is wonderfully warm and intimate. At the most, 20-30 people pack into these two small rooms, and the close quarters means that you are forced to meet and talk to your fellow wine drinkers. Two out of the three times we’ve been there, we’ve had Germans who were young kids during WWII come tell us about their first experience eating bananas and oranges given to them by American GIs. It really is quite nice of them to tell us this, and it makes us feel welcomed in Stuttgart, where our social circle mainly revolves around the large community of expats working for the many international companies based in Stuttgart. 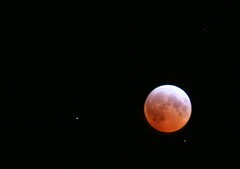 Anyway, so we went last Saturday, which happened to be the same night as the big lunar eclipse. Between 5 of us, we had about 6 liters of wine, so by the time the U-Bahn got me home, I wasn’t as steady as I needed to be to take some good eclipse photos. I managed to shoot two frames before passing out. My next one is really a drunken picture, and the following night I took a few more frames since my camera was already out.